In years past for orientation we’ve had streams of first years coming through the media center before being whisked off to their next event, small groups pop in for couple hours with just enough time to make a quick iMovie mashup, and even a group sing along in one of our podcast rooms. This year we got to work with a group of enthusiastic first years over four days to create radio stories as part of the Pre-Orientation program. Our program included an interview technique Q and A session with Tony Moore and Joseph O’Neill from Marketing and Communication, audio production session, a DJ booth practice run with WDCV technician Tyler Garrett, and quick study session of our favorites like This American Life, Planet Money, and RadioLab. 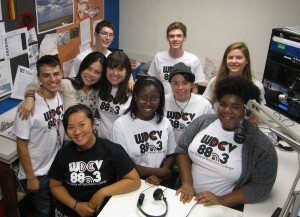 The result was five great stories which then aired live on WDCV during orientation. 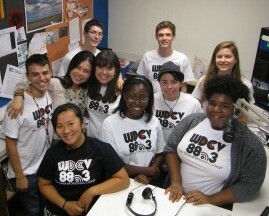 Check out the programs below and the full stories with pictures on WDCV.